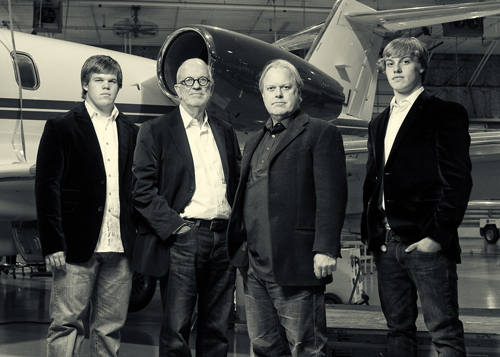 Todd Duncan (middle right) with his father Robert (middle left) and twin sons, Harrison (far left) and PK (far right). My aviation career spans a quarter century, and during those years, I’ve seen almost every one of our competitors bought, sold or change their name. 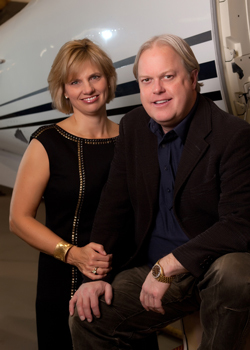 Duncan Aviation has remained exempt from this practice by investing in a family owned brand that’s stronger than ever. Our team’s collective courage, attitude and vision have allowed us to connect with our customers on a more personal level than much of our competition. I think that level of respect for all individuals is what helps differentiate us from the rest. We’re more than a company, we’re a family, and we approach every project with the same level of care. We. It’s a strong word and one I hear a lot at Duncan Aviation. Everything we do involves one or more teams. There’s strength in numbers. Instead of having one decision maker, we entrust our people—all of our team members—to make the right decision each and every day, whether it’s right in front of a customer or internally. Giving our team that kind of responsibility allows them to step up and show courage. Without the courage of those first few Duncan Aviation team members back in 1956 and the more than 2,000 team members we have today, we wouldn’t be where we are. Sometimes those decisions are small, other times they’re large. But they’re all important ones because they affect our overall goals. Every experience allows us to gain a bit more courage, strength and confidence. One of my earlier memories is of a Duncan Aviation company party. It was 1976, the bicentennial year, so we had a big celebration at my parent’s house outdoors. A couple hundred employees came, and I remember feeling this sense of family—somehow, I knew we all supported each other. I saw this as a young person and that experience, that collective attitude, is something we try to replicate every day at Duncan Aviation. There is no excuse for us growing larger and losing that essence. And we make a conscious effort to keep this feeling alive. I know our customers immediately pick up on that attitude and it’s an extra value that comes with the Duncan Aviation experience. Benjamin Franklin once said, “By failing to prepare, you are preparing to fail.” Failure was never even an option for Duncan Aviation. We’ve had some tough days, weeks and even years, but I’m really excited about the next 10 years for our company, for business aviation, for my career, as well as for our team members’ careers. I think our 10-year plan lays out a road map for us, certainly one that can change and shift when we encounter the unpredictable, but one we are all behind and one that we will all contribute to. As our locations continue to grow in size and number, I look forward to expanding into new customer markets and into global markets where we haven’t yet reached or where we’ve just begun to make connections. As difficult as business aviation is, I’ve never been more excited about what’s to come. Join us for the ride.